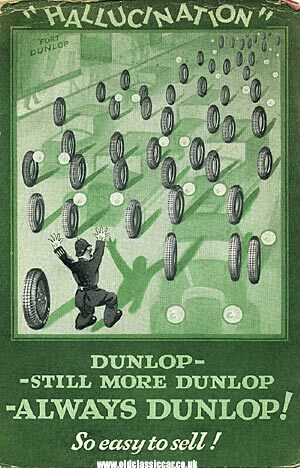 Dunlop Tyre blotters from the 1930s and 1950s. Homepage. This page: A great blotter from the 1930s given out by the Dunlop tyre firm, and another for Dunlop cycle tyres. Dunlop Tyres - "So easy to sell!" Another interesting piece of automobilia now featuring in the motoring collectables section. Issued by Dunlop Tyres, either in the late 1920s or the 1930s, this is a desk blotter featuring a worried-looking policeman, hallucinating outside Fort Dunlop, the famous Dunlop building in Birmingham. A sea of motor-cars are heading his way, at least in his mind they are, all shod in Dunlop's finest motor-car tyres. The illustration is titled "Hallucination", and would have been issued to garages and service agencies in the UK, promoting the company's range of automobile tyres: "Dunlop - Still More Dunlop - Always Dunlop! - So easy to Sell!". Advertising items like this were once commonplace, in the days when people wrote letters and invoices in proper ink, rather than printing something off from a PC. Similar examples of motoring-related desk blotters given away by Brico piston rings, and Mobiloil lubricants, are also featured on oldclassiccar.co.uk. A different Dunlop blotter also features on this site, this one including an endorsement of Dunlop Tyres from land-speed-record ace Sir Malcolm Campbell. Click here to see some of the other car-related collectables that now feature on this site. In addition to car tyres, Dunlop soon became a recognised brand name for bicycle tyres, and many's the cyclist who never left home without a Dunlop puncture repair kit in his or her saddlebag. 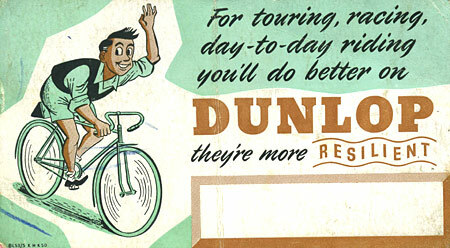 This next blotter promoted their range of cycle tyres in the 1950s. A jolly young fella speeds along on his two-wheeled machine, waving as he rides by. Dunlop tyres - "... they're more resilient".